Below deck the boat comes with all the dockside and shore power amenities like sink with hot and cold water, stove, fridge and a microwave oven. The microwave, fridge and stove have never been used. The boat will sleep four people comfortably! It has a fully enclosed marine head with a hot and cold shower and a marine toilet with pump out, the shower & sink in the head have also rarely used. Below deck the boat comes with all the dockside and shore power amenities like sink with hot and cold water, stove, fridge and a microwave oven. The microwave, fridge and stove have never been used. 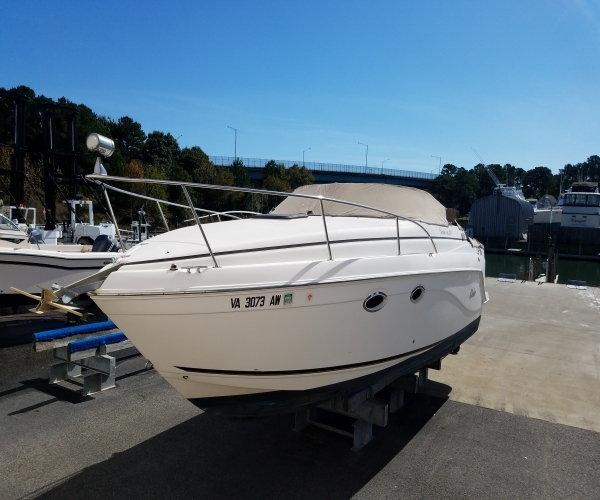 This boat has loads of features like Raymarine touch-screen chart plotter/fishfinder & 9" screen, VHF radio, compass, trim tabs, remote spotlight, AM/FM CD Stereo. At the helm, there is a nicely laid out instrument cluster with a built in GPS and all the gauges to monitor all your engine functions. One of the most popular and best selling boats in the Rinker Boats line up is the 270 Fiesta Vee. 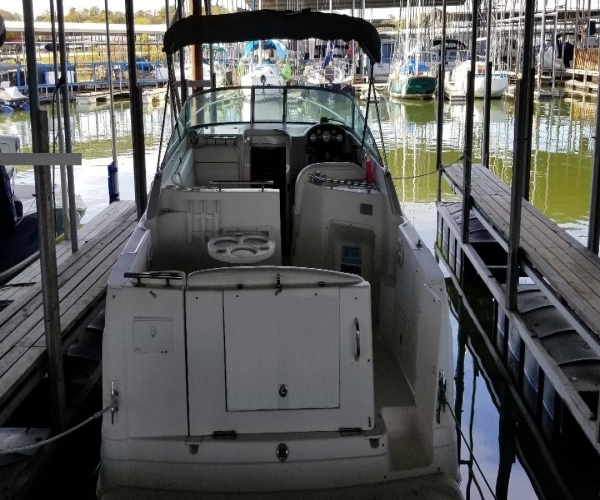 This single engine cruiser with it's wide 9' 1" beam, gives you all the room and amenities for an overnight or weekending experience on the water.This boat is powered by the 320HP Volvo engine with the Bravo III outdrive. The cockpit has a very entertaining lay out with a port side L-lounge type seating a single captains chair at the helm and a full bench seat in the stern. The cockpit also features snap in cockpit carpeting and a wetbar. 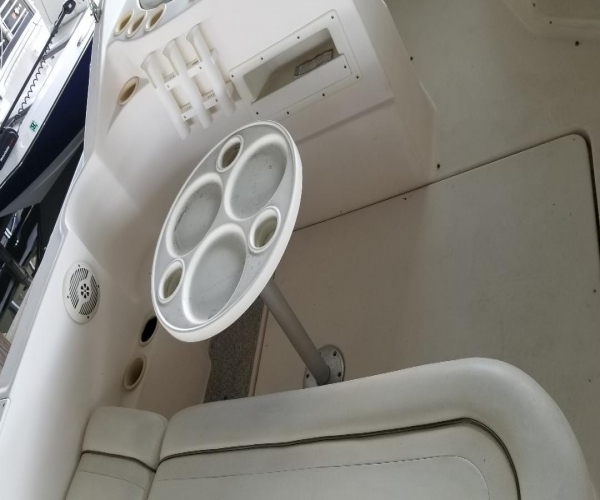 At the helm, there is a nicely laid out instrument cluster with a built in GPS and all the gauges to monitor all you engine functions.This boat has loads of features like VHF radio, compass, trim tabs, remote spotlight, A/C, AM/FM CD Stereo. Below deck the boat comes with all the dockside and shore power amenities like sink with hot and cold water, stove, fridge and a microwave oven. The microwave, fridge and stove have never been used. The boat will sleep four people comfortably! It has a fully enclosed marine head with a hot and cold shower and a marine toilet with pump out, the shower & sink in the head have also rarely used. At the transom there is an extended swim platform with a 3 rung boarding ladder and a hot/cold transom shower.